A reflection of my personal understanding and a bit about my involvement with this work. Born in 1864 in modern Liaoning Province in China's Northeast, Wang Fengyi 王鳳儀 is celebrated in China as a peasant saint and the founder of a system of healing that has been translated into English in phrases like "virtue healing" or "five-element healing through the emotions" (xing li liao bing 性理療病, literally "treating disease through inner nature principles"). Rooted in a powerful combination of ideas and practices from Buddhism, Confucianism, Daoism, and Chinese medicine, the system of healing through emotional release, moral cultivation, and virtuous actions that Wang Fengyi (1864-1937) developed, has persisted and grown in China over the past century. It continues to be practiced in rural northeastern China by local healers who successfully employ storytelling, lectures on virtue, personal confessions, and a set of five chanted affirmations modeled on the five elements, to reverse any kinds of disease processes in the patients who come to seek their help. Commonly known in English as the "five elements," the wu xing 五行 (more literally translated as "five phases, movements, or dynamic states") consist of wood, fire, earth, metal, and water, relate to each other in cycles of control or generation, and are associated in Chinese medicine as well as in the Wang Fengyi system with the liver, heart, spleen, lung, and kidney respectively. According to Wang Fengyi's teachings, and differing slightly from standard Chinese medicine theory, these five elements are further associated with the five virtues of empathy (仁 ren), ritual and propriety (禮 li), integrity and trust (信 xin), justice and righteousness (義 yi), and wisdom (智 zhi), as well as with the five vices of anger (怒 nu), hatred (恨 hen), blame (怨 yuan), irritation and judgment (惱 nao), and annoyance and disdain (煩 fan). A video by Heiner Fruehauf that includes a recording with Liu Yousheng. In 2010, a group of foreigners for the first time participated in a Wang Fengyi retreat in China. This group included the three current leaders of this work in the West: Heiner Fruehauf, Tamara Staudt, and Laurie Regan, all affiliated with the National College of Natural Medicine in Portland, Oregon. Since 2011, these three teachers have been organizing and leading annual silent two-week retreats in the United States, outside of Portland. Participants from these retreats continue to meet regularly in different formats to chant and witness each others' struggles and progress with the work and to discuss its application in healing work. A Chinese-to-English translation of Wang Fengyi's own writings is currently being prepared, to be published by Happy Goat Productions later in 2014. 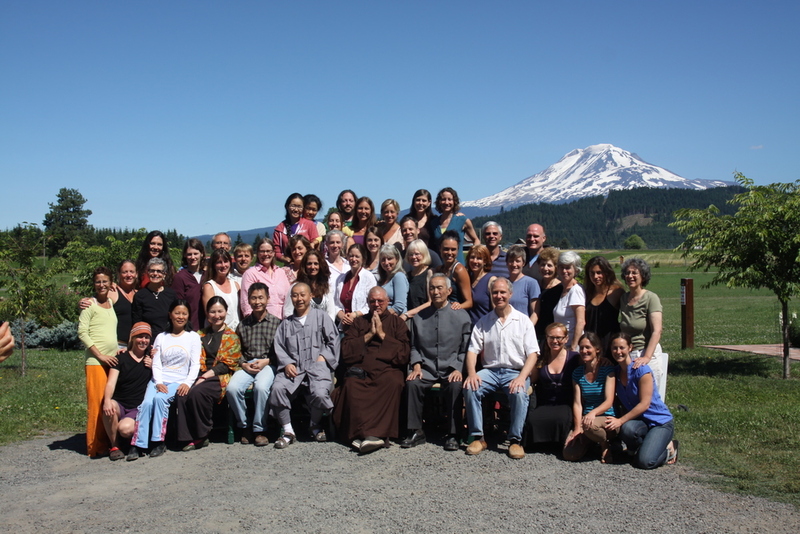 Pictures from the 2012 Shanrendao retreat at Trout Lake Abbey that I had the great fortune of participating in. I ended up at the 2012 retreat out of sheer luck, or yuan fen (緣分 or karma), depending on your perspective. I had recently dissolved my goat farm and moved from a small village in Northern New Mexico to Oregon to teach at the National College of Natural Medicine in Portland. My life had been turned upside down, my trust in the inherent goodness of human nature had been shattered, and I was full of unresolved grief over the loss of my simple farming lifestyle full of goats, bees, a beautiful wild mustang, and apple trees, which had made a lot more sense to me than my new life near the big city of Portland. I had years of experience teaching Chinese philosophy, religion, and medical history, and of translating Chinese medical literature. I considered myself a practitioner of Chinese medicine in the sense of "nurturing life" with my biodynamic farming practices: connected to nature and all the microcosms and cycles in the macrocosm, from the seasons, stars, and moon to my animals' reproductive cycles and the microorganisms in the soil. But I had never practiced those aspects of Chinese medicine and culture that pertain to what we might call "cultivation of the heart" in English. While obviously influenced in my outlook on life by my lifetime of studying the wisdom of the ancient Chinese sages, the truth of their message had never fully sunk in or touched me to the core of my being. 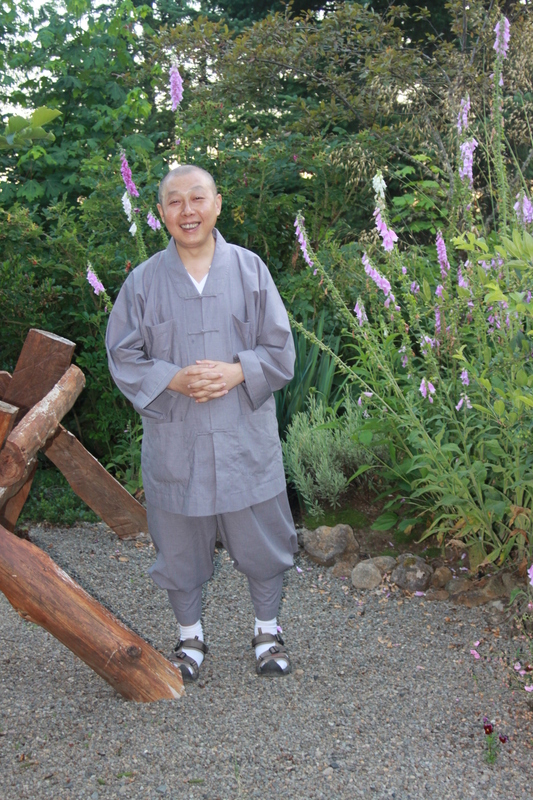 Facing Liu Lihong and an image of Wang Fengyi during the Shanrendao 2012 retreat. 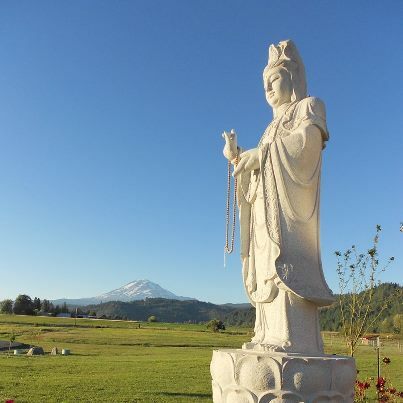 The 2012 Shanrendao (善人道 "Path of the Virtuous Person") retreat changed all that within the first few minutes, when we received our first assignment: to contemplate (and then publicly acknowledge) the debt we owe to our parents and ancestors, or in other words, to honor our roots. As a native German only a generation removed from the Holocaust and Nazi trauma and the granddaughter of an important general in Hitler's army, I had grown up full of shame of my own history and roots and had resolutely turned my back on my family's and country's past by moving first to Taiwan and then to the US as soon as I could and denying my national and family identity. As for so many Germans of my generation, my country's horrid past has instilled in me a visceral aversion to nations, anthems and flags, war, bullying, violence, authority, men in uniforms, racism, and other aspects of the Nazi regime. But the German public and private determination to never allow history to repeat these horrors has also left deep wounds in many of us, due to unresolved emotions, denial of personal responsibility, trips to concentration camps etc. at too vulnerable an age or without sufficient space for processing, and trans-generational trauma. After many long hard days of introspection devoted to "emptying out the garbage can," by recognizing and admitting our past wrongdoings with sincere remorse and intense emotional releases, for the first time in my life I was able to experience true gratitude for the world around me, first to my parents, for everything they had done for me, and then for every other aspect of my life, down to the core of every cell in my body, accompanied by deep regret for my previous lack thereof. The first thing I did after the conclusion of the retreat was to call my parents to thank them, and my life has never been the same since. Sitting in silence: Sara Frankenburg's painting of our shared experience of the Wang Fengyi retreat, hanging in my tea room. The second book I have translated on Wang Fengyi's teachings is a more systematic and comprehensive account of his teachings. Containing the Chinese text side-by-side with my English translation, this book offers the reader a survey of the whole system of "Five Element emotional healing" from the ground up in a clear, easy-to-follow presentation that is concise and seemingly simple, yet so deep and powerful. You can read more about it on its page in our "Store" (including the entire chapter 1 and an excerpt of chapter 8) or purchase it here directly.